Life on two wheels: Pumped!! In hommage to my late close friend Bob Leong, who preferred to go by his avatar BobSkoot, I wrote that Bob was full of good surprises. I was fond of thinking of Bob as a wizard. He had the gift of making good stuff happen. With his passing, I resigned myself to a life without Bob's surprises. Then I got an e-mail from Brad and Brandy. It turns out that Bob would buy stuff from time to time and have it sent to Brad and Brandy in Oregon, taking advantage of free shipping offers that sadly don't extend north past the border. Bob was rarely in a rush to have the things he ordered, and was content to pick them up whenever circumstances allowed. That was how Brad and Brandy came to be holding a purchase for Bob. With his untimely passing, it was destined never to be collected or delivered. Unbeknownst to me, a consensus developed among west coast bloggers that Bob would have wanted me to have the item. On Wednesday it arrived on my doorstep. It didn't take long for me to tear the wrapping off like a little kid on Christmas morning. 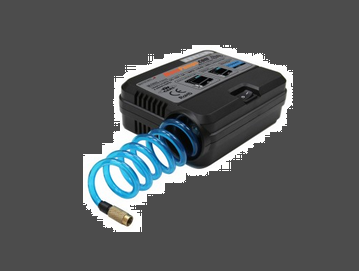 An amazingly well thought-out, high-performance, portable, 12 volt air pump. It gets its power from the vehicle's electrical system. You can tell it's designed for the moto community because it's compact, it has a robust lossless screw-on air chuck, and the primary electrical connection terminates in a female two-prong SAE connector. Stock Vespas don't have one of those, but I do. 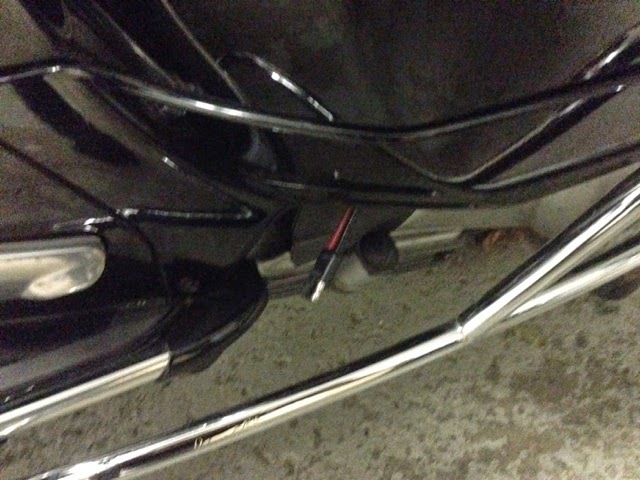 I installed one direct from the battery, hours prior to my departure on last's year's moto trip with... guess who... Bob. The line, which is fused at 10 amps, runs from the battery compartment in the floor, back through the bike, and exits just below the left rear fairing. 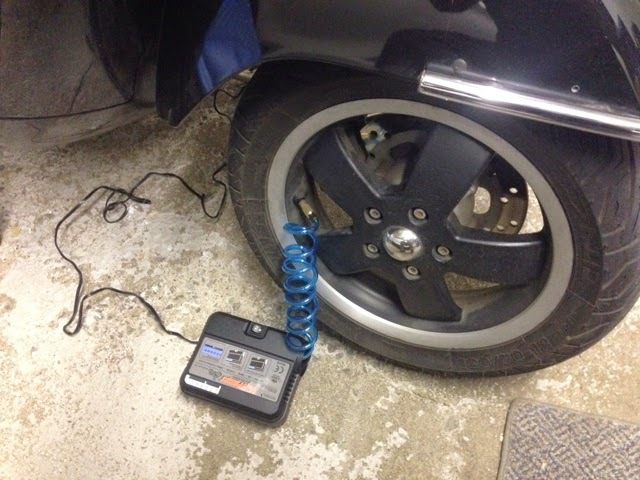 I tried it out minutes after unwrapping it and it's by far the best way yet to adjust the tire pressure on my Vespa. My full size air compressor is technically superior, but when you factor in turning it on, waking the dead while it builds pressure in the tank, uncoiling the hose, connecting the hose, plugging in the tire filler attachment, and clipping the business end onto the valve, the MotoPump is way, way, more convenient than the full size compressor. That doesn't factor in the time it takes to take the compressor components off, empty the tank, store the hose and accessories, and so on. Comparing the MotoPump to the portable 12V pump I had been keeping on the bike for emergencies, the MotoPump takes up a lot less room than my former loud and painfully slow portable pump that had no built-in gauge or worklight. The MotoPump also comes with an array of accessories that will allow you to inflate anything, and includes both an extension with a standard car 12V plug, and, for good measure, an extension with battery terminal alligator clamps, just in case you're servicing an ATV or a farm tractor (nudge nudge, hint hint, wink, wink). Even with the accessories, it still takes up a lot less room than my old pump. The MotoPump is also amazingly fast for a portable pump. In fact, it's amazingly fast for any pump; period. Armed with this baby in my Vespa's underseat compartment, I could rescue stranded motorists in full-size SUVs! Wouldn't that be a hoot! Next time I see a stranded motorist, I'm going to stop. Thanks Bob, wherever you are, I feel you smiling, truly I do. And thanks to Brad, and Brandy, and Richard if I'm not mistaken, for your kindness in making this happen. I am blown away (sorry for the pun). Bob gave me one similar to this pump back when I still had my yellow Beemer. We made good use of it on a Washington trip when Roland's Vespa had a flat. Wherever you are, Bob. You did good. There ya go! He will always be watching over you with good, properly inflated tires rolling underneath! The really nice thing Sonja is that I will use this pump now as THE way to manage air pressure in all our tires, it's that good. David, looks like a really nice one that I've not seen before.....leave it to Bob to have found it! That's a nice pump unit, I'm still carrying around the innards of a small auto air pump unit....not as spiffy but works. A couple of years ago in Oregon, Bob dug out his compressor and it literally fell apart in his hands. He was really frustrated with it as this was the first time it was needed (Karen had a low front tire on the Star). We used my CyclePump and he said that for some things the cheapest isn't necessarily the best choice especially if it doesn't work when it's needed. What an awesome way to remember Bob. Very cool. We are sure he would have wanted you to have it since you were so close to him. Ride safe and enjoy. You now have a little bit of Bobs kindness with you on every Vespa trip. I'm not sure where he found it, but I noticed that Aerostitch carries the same manufacturer's products. It really is Rob, lots of punch in a small package. And the gauge is accurate, and backlit. Really nice. If it helps, I really was blown away and the pun I only noticed later. But 'oy' nevertheless Dom. Richard, when Bob, Karen and I met in Pennsylvania, one of the things Bob did was haul out a pump (it was one he had taken out of its casing to conserve space) and he pumped up Karen's front tire. He didn't check my tires though. He must have had an eye for underinflated tires. There is no doubt I'll think of his kindness every time I open the pet carrier and see neoprene sleeve the MotoPump lives in. Thanks again Brandy, and thank Brad too. You really made my day. My micro compressor is one of the handiest tools I have ... if I could just figure out how to get it to inflate my air mattress I'd be in heaven. Enjoy your gift. I'm sure your delight would make Bob smile. Thanks Karen, I'm sure you're right. This just shows Bob's thoughtfulness and he was definitely the Yoda of gadgets. I miss him and have been struggling watching the weeks tick by on his blog since he left us so suddenly. Now that's cute, and totally fits.